Illustration by Nicolle Rager Fuller, www.sayo-art.com, copyright 2009. There have been five known mass extinctions in Earth’s history, the most recent of which took out the dinosaurs 65 million years ago. Uncovering this history was a scientific triumph, but if we manage to prevent the next one that would really be something. This June, a team of six biologists calculated that since 1500, vertebrate species have been going extinct at rates up to 100 times faster than is typical—and the number is rising. In other words, the paper’s authors claim, a sixth mass extinction is now underway, and it’s being caused by human activity. Two of the paper’s authors, Gerardo Ceballos and Paul Ehrlich, along with Paul’s colleague and wife Anne Ehrlich, have just released a book on the topic. 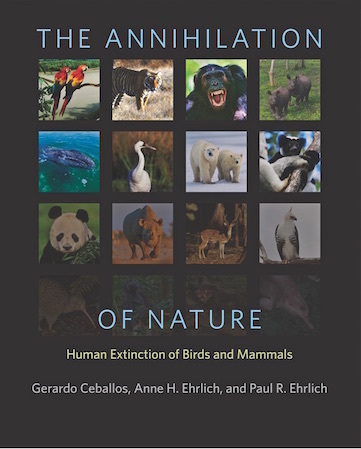 In The Annihilation of Nature: Human Extinction of Birds and Mammals, Ceballos and the Ehrlichs meticulously document a representative sampling of extinct, endangered and threatened birds and mammals. They assess the causes of each animal’s woes while making the case that humans should start caring. The book’s thorough and methodical style is both its strength and weakness: I learned a lot, but it occasionally reads more like a textbook than the emotional clarion call its authors say they are going for. The two-column-per-page layout and ubiquitous full-color photographs exacerbate the textbook feel. But the prose is accessible and the photos are gorgeous. These three scientists are far from the first to write on the current biodiversity crisis. 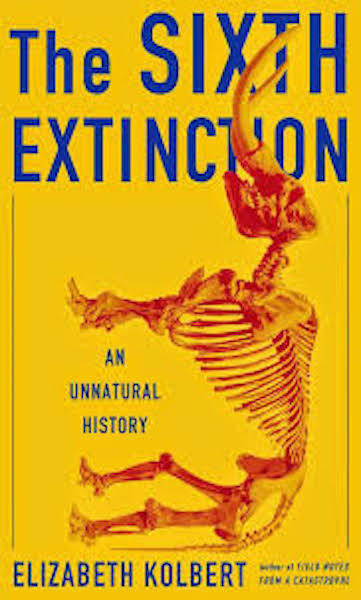 Elizabeth Kolbert won the Pulitzer Prize for non-fiction for the vibrant and eloquent The Sixth Extinction: An Unnatural History. Ceballos and the Ehrlichs lack Kolbert’s way with words (as does most everybody else), and despite a handful of moving passages they do not evoke the wide range of feeling that Kolbert does. Yet in their workmanlike litany of the dead and dying, the book may offer a clearer path to change. For those familiar with the Ehrlichs’ past work, the kind of change these two Stanford scientists endorse may make you wary. 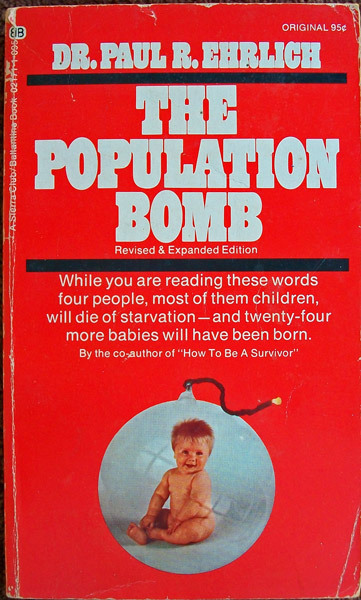 Their most famous—or infamous—work is 1968’s The Population Bomb—a thin volume advocating immediate and if necessary coercive population control. In that book, Paul (with Anne listed as “virtually a co-author” in the acknowledgments) makes explicit his view that the number of humans is the root cause of human hunger and environmental deterioration. He expected mass starvation within decades, and was willing to ruffle feathers to prevent that. The book has been heaped with criticism in the years since, and it’s easy to gather why. The famines have yet to arrive and many of the policies Ehrlich recommended—making food aid to poor countries contingent on government population control, mandating sterilization of Indian men after their third child—range from mildly problematic to troublingly authoritarian. Yet The Population Bomb is not quite as callous as all that may sound. Paul saves his fiercest condemnations for the affluent of the United States. He derides the government’s imperial adventures in the name of anti-Communism, excoriates industry for profiting off of dangerous chemicals and heaps scorn on consumer lifestyles that not only require the depletion of national resources but lead to the over-extraction of resources from developing countries. He makes clear that rich countries are over-populated too and that, if the United States is to have any moral standing in this debate, we must rein in our own consumption and population. But still: calling for forced sterilizations in India can’t be glossed over, and it has lost him some friends over the years. His concern for the global poor is doubtless sincere, but then again—what’s that they say paves the road to hell? In Annihilation, the Ehrlichs appear to have learned some lessons from previous decades. They repeatedly use the modifier “humanely” when discussing population control, and they do not openly entertain coercive methods. Whether this is due to change of heart, political calculation or the influence of Ceballos, their coauthor and a conservation biologist at the Universidad Nacional Autónoma de México, it allows the reader to ignore their hesitations and zero in on the core ecological argument. In the chapter “Why it All Matters,” they elucidate the benefits to agriculture of a diverse array of pollinators, seed dispersers, insectivores and other animals. The varied organisms fit together in a tapestry of activity—one that cycles nutrients and produces valuable chemicals (like oxygen) that we depend on for survival. When even one thread of this tapestry is disrupted, there can be unintended consequences. For example, the decline and extinction of the passenger pigeon left many uneaten seeds. This glut of seeds may have led to an increase in mouse populations, which led to an increase of ticks and of Lyme disease in humans. An uptick of rabies cases in India can be linked to a dearth of vultures: These strong-stomached birds once safely scavenged tainted carcasses that now infect feral dogs, who in turn infect humans. As the authors document, Earth’s ecosystems are in dire need of such protection. The book devotes nearly half of its pages to specific bird and mammal species whose numbers have dwindled, or are already gone. Though the book is short, the sheer volume of death is overwhelming. The diversity of ways that human enterprise has managed to kill would be impressive were it not so depressing. People worldwide have captured wild animals to sell as pets or to use in laboratory experiments. In some places, wild animals are trained to perform on the street. They are poached as food, or for their horns and tusks to be sold for nonexistent medicinal benefits. They become collateral damage in our wars, as the gorilla was in the Rwandan genocide, or strategic targets, as the bison was in America’s war against the Plains Indians. The continued expansion of the global economy assaults aquatic species with oil spills, plastic litter, pesticide runoff and other pollutants, with dams that fragment habitat and reroute water to agriculture, with ocean acidification, warming waters and overzealous, indiscriminate fishing practices. Whale songs and dolphin echolocation are thrown off by noise pollution from military testing, the shipping industry and fossil fuel exploration, sometimes with lethal results. Governments drain swamps and corporations dig mines, as birds run into buildings and wind turbines and are electrocuted by power lines. Forests fall at human hands for lumber and to clear land for oil palm plantations, roads, towns and farming. Inflated populations of domestic animals overgraze, and predators who might threaten cattle or other farm animals are shot and poisoned as pests. Most of these threats affect more than one animal, and most animals face more than one threat. Each species has a story: an Indian rhino strangled by a wire noose, poached for his horn; a family of orangutans in Borneo starving as the surrounding forest is cut down. While the authors highlight where ecosystem collapse negatively affects humans they want you to feel the emotional pain of these individual deaths. Instead, they argue, biodiversity interests should be taken into account well before a species is officially endangered. They call for making agricultural land more hospitable to wildlife and preserving existing habitat where possible. They plea for governments to curtail rampant economic growth and the exploitation of the Global South’s resources. They do not offer a fully developed analysis of capitalism and colonialism, but there is a clear understanding that, as Pope Francis has written, this economy kills. In The Sixth Extinction, Kolbert wonders whether demolition is encoded into our very genetics, and thus inevitable. The authors of Annihilation also have harsh words for their species, calling Homo sapiens “the most destructive animal,” and only “supposedly intelligent.” Yet the picture in their book shows the crisis is rooted not just in our DNA but in our social and economic structures. These structures, in the end, face the same essential constraint as a biological organism: Evolve or expire. "A solution, one realizes, must permeate all aspects of our society, especially the way we produce food" No, a 'solution' must permeate societies around the world and must include a change in the accepted hierarchy of human values that have created the situation in the first place. So what might be capable of communicating such a message of necessary change to the whole of humanity? And what would have the authority to define that change across such a broad range of cultural and value difference? Thus is the profound immensity of the problem better understood. Certainly such a 'solution' is beyond any existing or imagined political process, leaving only one option left to imagine. That for such a solution to exist , it will not be of human intellectual origin! Easier done than said.